For years I used other brands. And for years I had to regularly replace broken phones. Then I switched to VTech. The phones are reliable and have lots of great features. I was perfectly happy with my current VTech phone and probably would have kept it for many years, but then I saw the VTech LS6475-3 Phone System I knew it was just what my family needed. As you can see from the photo, this phone has 2 handsets and a wireless headset. Since I’m always multi-tasking, the headset is fabulous and really makes things easier. I still use the handset with the speakerphone quite a bit, but it’s really nice to be able to walk around the house with the headset on. It was easy to get the phone set up. It works well, as expected, and the features are great! HOW TO CONNECT - You can can like VTech on Facebook, subscribe to their newsletter and follow them on Twitter. 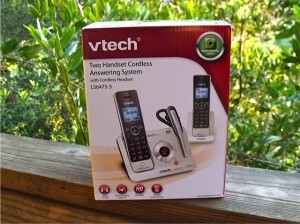 DEAL – VTech Phones offers free shipping on orders over $50. Here’s how to enter to win …. Giveaway ends June 15, 2012 at 8pm Pacific Time. Giveaway is open for residents of the US and Canada only. Winner will have 48 hours to respond to notification with shipping info and claim prize – if no response, another winner will be chosen . Subject to the official rules. No purchase necessary – void where prohibited by law. Disclaimer/Disclosure: Review sample and prize provided by the giveaway sponsor. Originally published on 2012-06-01 by Valerie Mitchell at Sweep 4 Bloggers .